Do you ever throw your hands up in the air in frustration because your partner doesn't believe in the Law of Attraction? Do you ever wish your partner wasn't so negative and would at least try to be more positive? Do you get tired of your partner not supporting you in your desire to use the Law of Attraction to manifest your dreams? Either way, it's still the same. You know they want the best in their life… you know they want the best for you… But why don't they trust that the Law of Attraction can manifest dreams? You might cry or yell or feel all alone because all you want is for your partner to support you. You want them to believe in you and to tell you so. You want them to get on board and start using the Law of Attraction too because you want them to manifest their dreams. You don't want to hear your partner be very negative about everything. You don't want to see your partner shrug when you tell them about another Law of Attraction success story you've found. You don't want to see your partner's eyes cloud over when you talk about how much your vision board inspires you. If you want your partner/husband/wife/friends/family to stop being so negative, about the Law of Attraction, you have to stop focusing on their negativity. One of the most important things to remember with the Law of Attraction is that you create your reality. You give power to what you focus on, and thus draw more of it into your life. Each time you focus on what negative things your partner said or did, you become vibrationally aligned with that negativity. As a result, you create more experiences where they are negative. The same goes for focusing on whether or not they believe in the Law of Attraction. If you are focused on their not believing in it or they're not using it, you will create more of their not believing in it and not using it. When you focus on your partner's negativity, you aren't giving them an opportunity to change. Forget about what your partner is saying or doing. Forget about whether they believe in the Law of Attraction. Forget about whether they are supporting you in your use of the Law of Attraction to manifest your dreams. Focus on your thoughts. Focus on including only the best possible feelings in your vibration. The more you focus on the positive, the more positive experiences, people and events you will draw to you. As you shift away from focusing on your partner's negativity, you can begin to focus on the things you like about them. How do they support you? Maybe it isn't their words, but maybe they do things like take out the trash. As you focus more on the positive things about your partner, the more you'll begin to see an energetic shift. It may not happen over night. But as your vibration changes, they will start to change and become more positive. If you want to get your partner/family/friends on board with the Law of Attraction, you have to stop trying to convince them. You can spend all the time in the world trying to convince them to get on board with your beliefs, but it's not the solution. Think back on when something similar has happened to you. Maybe someone was trying to convince you to do something you didn't want to do. Or they were trying to convince you to join their religion. No matter how much they talked it didn't work, did it? It only became annoying and frustrating. That's how your partner feels when you keep telling them they have to use the Law of Attraction. No amount of convincing is going to get results. You have to show them. I'm not talking about creating a song and dance or a sock puppet theater explaining the Law of Attraction visually. I mean putting your 110% into the Law of Attraction. Completely embodying its principles. Letting your results show your partner that this Law of Attraction mumbo jumbo really does work. Go out there and manifest your dreams. Each and every one of them. Show them that it can be done. Be the proof your partner needs. But even then sometimes there are people who you just can't win over no matter what you do. They just insist on having their head in the sand. It's safer that way. They may just want things to remain safe and stable – the way they've always been. It isn't just life that they want to remain the same. They want you to remain the same. They may be afraid of losing you if things were to change. They may be afraid that if this Law of Attraction stuff does work then they won't have any excuses for not changing their life. No matter how much they complain, deep down they might actually like it the way it is. It all boils down to this. If you want to manifest your dreams, it shouldn't matter what anyone else thinks. I'm not telling you to leave your partner/friends/family. I'm not telling you to be rude. But this is about YOUR life and YOUR dreams. Not anyone else's. Are your dreams big enough to go after regardless of what anyone else thinks? Either they are or they aren't. Your partner is not your Law of Attraction guide. Your partner is not your spiritually minded best friend. 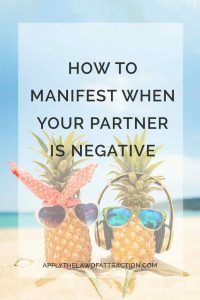 So what if your partner is negative all the time and is not on board with Law of Attraction! It's crazy to try make them be more like you. It doesn't matter what your partner thinks about the Law of Attraction. Do you fully believe in and understand the importance of their favorite hobby/sport/TV show/whatever? Do you think they're a little silly about something that isn't that big of a deal? Go ahead and share your dreams and goals. But if the big picture scares them or talk of the Law of Attraction leads to fights… Go slowly. Take baby steps. Let your partner see everything you've achieved with the Law of Attraction. Let them see your excitement at how well it works. Let your partner come to you, and ask you how you're doing it. It doesn't matter if it takes 10 months or 10 years. Share all of your excitement about Law of Attraction success stories with others who think like you. Talk about the newest LOA book you've read with people who like to read similar books. Respect your partner's right to live their life the way they believe is best. Understand that they are where they are on their journey. You didn't get to where you are because someone hit you over the head with the Law of Attraction and told you to believe in it. It was a process. Allow your partner the same process. Your partner is there to be your partner. If you need friends who think like you do, get some. If you need a meetup group to feel supported on your journey, join one. And if you choose to manifest your dreams, you know what to do. What Happens When Two People Want the Same Thing? I needed this post today. It is my roommate who is negative in the manner you are talking about and at times it has really pulled me down. Today I was thinking about my roommate’s negativity on everything and wondering if that is why I have had issues with manifesting stuff. From your post I see that I need to just stop listening and being affected by someone else’s beliefs and negativity. Instead focus on creating my reality the way I want to be. Hi Elizabeth, Thank you for your wonderful site. I know how much work maintaining a site is and you are doing an incredible job helping so many people. I have a question for you: I a reading your book “Manifesting love”. My man and I are no longer together and of course I would like to give our relationship another go. sometimes I am very good at focusing, sometimes not. Why not just dump them? They’re holding you back. If more people were bold about dumping family/partners and friends just because they are socially sanctioned relationships, we would have more affinity groups able to manifest more. My partner is on the fence, but he’ll have to get over it if we’re going to stay together. There is no point is staying with someone who is NOT supporting you.